Homemade sloppy joes made in the Instant Pot and ready to eat in less than 30 minutes! Not only is this recipe easy to make and easy to follow but it’s also really quick and comes out really flavorful! There’s no need to add any extra liquid into this recipe because of the ketchup and barbecue sauce. After the pressure has released, it’s as simple as stirring the ingredients in the pot and serving the meat on buns. It’s perfect for busy nights because it takes so little work! This recipe is simple to make and it’s also really easy to double to serve a large crowd! I use a 6 Qt. Instant Pot and it can be doubled easily! If for some reason it is not as thick as you would like when you take off the lid, turn your pressure cooker to SAUTE and let it simmer for 2-3 minutes. This will thicken up the sauce! 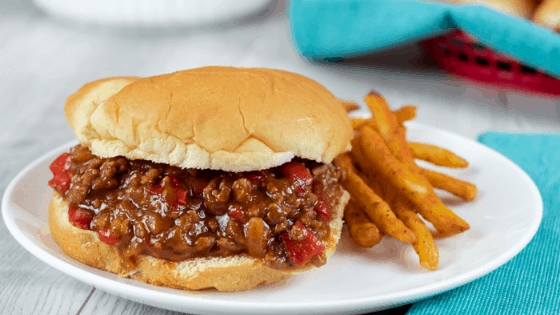 When serving these sloppy joes, I serve them on gourmet hamburger buns which are quite a bit larger than other hamburger rolls – you can get smaller buns if feeding a crowd and the recipe as is will stretch much farther! I’m not a fan of canned sloppy joes. Don’t get me wrong, I can eat it from the can but I really feel like there’s a lot of flavor lacking! I enjoy homemade versions much better because I can control the flavors within the sandwich and the texture! I like my sloppy joes saucy, full of flavor, and filling! I have been making sloppy joes from scratch for many years on the stovetop but now I make them in my Instant Pot because it so much quicker and there is no need to babysit the stove! Set the Instant Pot to SAUTE and cook beef, diced onions, peppers, and garlic until beef is browned. Drain grease if necessary. Scrape the bottom of the Instant Pot to ensure that nothing is sticking. Dump in the ketchup, barbecue sauce, mustard, brown sugar, and seasonings on top of the beef. Don't stir - close the lid and vent. Set to MANUAL/PRESSURE COOK for 5 minutes. Allow the Instant Pot to naturally release for 10 minutes. In a large skillet, saute onions, peppers, and minced garlic. Add the beef and cook over medium heat until the meat is browned. Drained if necessary. Stir in the ketchup. barbecue sauce, brown sugar, vinegar, mustard, and seasonings. Bring to a boil and then reduce heat and cover. Simmer on low for about 25-30 minutes and stir occasionally to prevent sticking.